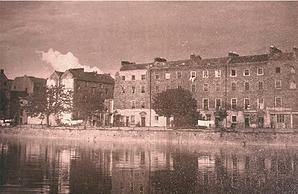 Arthur’s Quay was built in 1773 by the Arthur Family who were rulers and prince merchants of Limerick. Patrick Arthur built the quay to provide Harbour facilities for his timber importing business. His son, Francis Arthur, financed the construction of a block of Georgian houses on the site now occupied by Arthur’s Quay Shopping Centre. Whether intentional or not, this block formed the letter A for ‘Arthur’, meaning the family permanently stamped their names on the City of Limerick.